The Boo Pipes is King Boo's unlockable kart in Mario Kart: Double Dash!!. It is a gray version of Petey Piranha's Piranha Pipes, and can be unlocked by completing the Special Cup in Mirror Mode. Unlike most heavyweight karts, the Boo Pipes is unique for having traits similar to that of a lightweight kart; low top speed and high acceleration. 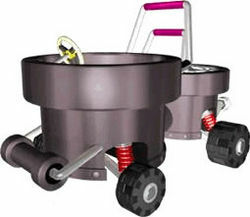 But unlike the lightweight karts, this kart is heavy enough to rival the weight of the Koopa King and Piranha Pipes. These traits make the Boo Pipes a very effective kart to use in GP races. However, it isn't very useful in Time Trials, due to its low top speed. The Boo Pipes has one of the best acceleration stats in the game, being on par with most of the lightweight karts. Its top speed is tied with that of the Rattle Buggy and the Koopa Dasher though. Lastly, when compared to all the other heavyweight karts, the Boo Pipes loses the least amount of speed whenever it goes off-road. 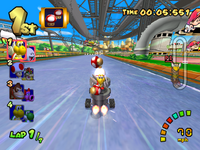 It is one of the four "out of the ordinary" karts for its weight class, with the others being the Green Fire, the Turbo Birdo, and the Barrel Train. Gōsuto dokkan Ghost "Paboom"; see Piranha Pipes. In terms of stats, the Boo Pipes may have been designed to be a heavier version of the Heart Coach, a medium kart with near-identical stats (other than weight) and even the same engine sound. The Boo Pipes, Heart Coach, Piranha Pipes, and Bloom Coach share the same engine sound. The Boo Pipes's horn sound is highly similar to the Piranha Pipes's horn sound, except for that it's lower-pitched. This page was last edited on March 7, 2018, at 09:23.